“The only real problem I see in the market,” says Andrew Mancais, “is the over-supply of properties under €300.000. Many of these were originally purchased off-plan by investors hoping to realise a profit by immediate re-sale as they approached completion. 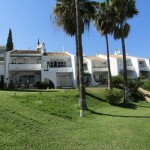 Now there may be as many as 3,000 of these apartments all coming onto the market around Nueva Andalucía in particular, just as we are having a slowdown.” This means that many of the investors will find themselves in a bind. Those who are over-extended and unable to make the final payments will have to reduce their prices, and their profits, in order to sell quickly. However, jumps of more than 20 per cent are still being seen in the western areas of the coast, like the Casares-Manilva area, where development is booming. Hamptons Fielding are also predicting that UK buyers, drawn by Spain’s low interest rates and driven by the UK housing boom, which shows no signs of slowing down, will continue to come to Marbella.